Destination Cover: Buddhism, the great religion was discovered more than two thousand six hundred years ago, in India by Prince Siddhartha- the Enlightened- the Buddha. Buddhism was born at Bodh Gaya, rapidly spread out of other parts of India. Luckly Orissa was one of the major centre of Buddhist study and philosophy. We try to cover some of the unique spot of those in our suggested itinerary. Upon arrival meet our representative at airport/ railway station. Then transfer to hotel and afternoon visit the historical place of incredible India- Dhauli-3rd BC and there excursion the rock edict of Moryan Emperor Ashoka (Dhauli santi stupa on top of Dhauli hill. And meditate at the meditation hall of Budha, sangha and dharma). Morning drive towards Langudi (a budhist sattelment was discovered in Langudi hill with rock cut stupa with pancha dyani mudra Budhistava . some fragment of stone copings and railing pillars were found. The railing pillars of the earlier variety like that of Sanchi belong to Mauryan age was found. After excursion drive towards Radhanagar- This is the only early settlement(3rd to 1st c BC) around which langudi and kayama hill surrounding. Then drive towards Ratnagiri and check in a nice hotel near Ratnagiri Mahavihar. Visit the three Budhist ancient university – Lalitgiri- ( ancient name – chandraditya Mahavihar-1c BC to 10 c AD) , Udaygiri-Madhapura Mahavihar- 1c AD to 12 c AD, Ratnagiri- ( Ancient name- Puspagiri mahavihar-8 c AD to 12 c AD) . famously known as the dimond triangle of Orissa and after full day excursion to visit the Maha stupa, Maha vihar, chaitya then drive towards Chowdwar check in the heritage palace and relax. After breakfast drive towards famous budhist village at “Maniabandh” via : Nuapatna. 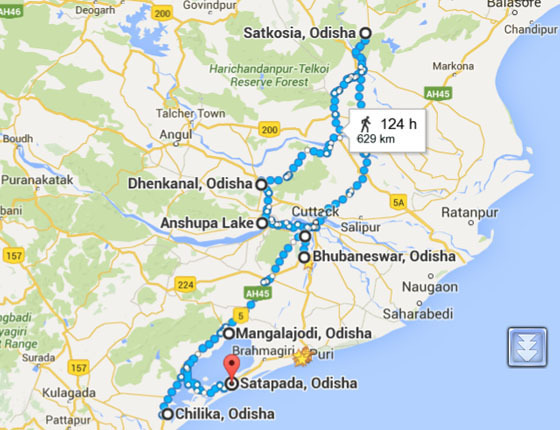 Then drive to puri. Check in a nice hotel on beach and relax. Morning puri sightseeing and then departure for Konark- excursion the sun temple at there and visit the ancient maha vihar at kuruma – where budhha statue is in Bhumisparsh mudra and also Statue of Heruka ( people popularly know as Jama- Dharma). Then drive to Bhubaneswar check in hotel. Morning departure for your onward journey. There is a nice Tibetian Buddhist Site a Jirang ( The Great Monastry of MahaPadma Sambhav ), we can add it in our program.